Objective To explore in depth how primary care clinicians (general practitioners and practice nurses) derive their individual and collective healthcare decisions. Design Ethnographic study using standard methods (non-participant observation, semistructured interviews, and documentary review) over two years to collect data, which were analysed thematically. Setting Two general practices, one in the south of England and the other in the north of England. Participants Nine doctors, three nurses, one phlebotomist, and associated medical staff in one practice provided the initial data; the emerging model was checked for transferability with general practitioners in the second practice. Conclusions These findings highlight the potential advantage of exploiting existing formal and informal networking as a key to conveying evidence to clinicians. The promotion of evidence based health care over the past decade has resulted in several dilemmas. Firstly, the proponents of evidence based health care advocate importing explicit knowledge from the world of research and incorporating it into practice,1–3 whereas the parallel vogue for knowledge management in the industrial sector has emphasised methods to elicit and promulgate practitioners' tacit knowledge or “knowledge in practice.”4–8 Secondly, many clinicians are concerned that the evidence based healthcare movement may, in its understandable enthusiasm to reduce idiosyncratic, suboptimal practice, undervalue the importance of tacit clinical knowledge in practice by naively promoting prescriptive guidelines that encourage “cookbook” practice. Thirdly, the overwhelming influence of local context on attempts to change clinical practice has presented almost insuperable challenges to the search for simple generalised techniques for implementing research evidence.9–12 Fourthly, the evidence from psychologists about the role of shortcuts such as “scripts,” “heuristics,” and “rules of thumb” in clinical decision making,13–15 which itself tends to play down the social and organisational context, has been generally forgotten in the over-rationalist model implicit in evidence based health care. Successful implementation of research evidence will require a deeper understanding of the processes of collective “sense making” by which knowledge, both explicit and tacit and from whatever sources, is negotiated, constructed, and internalised in routine practice. Raw research information can be transformed into knowledge in practice at many levels, so it is helpful to consider evidence based health care separately as (1) a social movement with clear values and conventions16; (2) a local context in which evidence based policies are agreed; (3) an individual clinician using the accepted evidence based approach; and (4) patients receiving evidence based treatment (fig 1). Although each of these different levels can operate independently (for instance, a patient might serendipitously receive an evidence based treatment when none of the other levels of evidence based health care is in place), they tend to be closely related. Yet much of the work on the implementation of research evidence conflates them or ignores their interrelationships. We set out to illuminate some of the reasons behind the inherent tensions described above. Our research aimed to study explicitly the ways in which primary care practitioners—general practitioners (GPs) and practice nurses—use evidence in their day to day decisions about the management of patients, both at an individual level (levels 3 and 4) and in their collective discussions about best practice (level 2), and how these interact. We were interested to understand the social and organisational processes by which evidence, information, and knowledge—tacit or explicit—become transformed into knowledge in practice. Ethnography underpinned the data collection, analysis, and interpretation phases of our study.17–19 We purposively selected and gained access to two highly regarded general practices. “Lawndale,” where we did our main ethnography, is a rural teaching practice in the south of England; the practice population is relatively elderly and middle class. The other practice, “Urbchester” is a contrasting, university based, inner city practice in the north of England, which treats a high proportion of unemployed and immigrant patients as well as students. We used Urbchester to expand and check out our findings from Lawndale. In Lawndale we studied all of the practitioners (nine doctors, including one GP trainee; three nurses; and a phlebotomist) and associated administrative staff intermittently over two years. We analysed their use of information and knowledge in clinician-patient interactions in the general practitioners' surgeries and nurses' clinics and in practice meetings. We collected data through non-participant observation and semistructured formal and informal interviews, supplemented where appropriate by documentary review of guidelines or practice protocols. Typically, we would briefly discuss a clinical encounter to explore why the clinician believed he or she had acted in a particular way. The observations and informal interviews were detailed in fieldwork notes; four of the formal interviews were tape recorded and transcribed. We also used unstructured non-participant observation to study a range of other clinician-clinician and clinician-support staff interactions in Lawndale practice meetings in which practice policy was reflected on and formulated. Three of these meeting were recorded and transcribed, we documented the others by using written fieldwork notes, as our piloting suggested that verbatim transcription was not a cost effective method for our purposes. Our complete dataset (box 1) therefore included individual clinical and general policy making encounters, with an auditable trail of fieldwork notes and thematic analyses. The principal analysis focused on our records of the observations and interviews. We analysed these thematically by noting and coding each piece of information in the fieldwork notes and interview transcripts and allocating these to emerging themes (this was done independently by JG for GP focused data and by AlM for nurse focused data); both researchers then discussed and iteratively reviewed these as the themes developed. This process involved transferring each relevant statement in the field notes and interview transcripts on to around 500 hundred “Post-it” notes and clustering these into emerging themes (box 2). Our analysis was informed by several theoretical frameworks rather than being a simple grounded theory approach. We were, for example, mindful of the role of social and organisational context in the construction and use of knowledge,8–12 of collective sense making,20 and of the role of communities of practice in knowledge management.21–23 However, we were not testing any hypothesis or preconceived models. During this process, we noted incidents atypical of the emerging model, which we used to further develop the analysis. We found that the individual practitioners did not go through the steps that are traditionally associated with the linear-rational model of evidence based health care1–3—not once in the whole time we were observing them. Neither while we observed them did they read the many clinical guidelines available to them in paper form or electronically, except to point to one of the laminated guidelines on the wall in order to explain something to a patient or to us. They told us that they would look through guidelines at their leisure, either in preparation for a practice meeting at which they were expected to bring the practice policy for a given clinical condition up to date or more informally to ensure that their own practice was generally up to standard. For example, one partner told us that when a new guideline arrived in the post he would leaf through it—as long as it looked authoritative and well produced—to reassure himself that there was nothing major that needed changing in his practice. If there was, he would discuss it with colleagues before deciding how to handle the discrepancy. The nurses told us that they would turn to guidelines when faced with an unfamiliar problem, and that once they were familiar with the procedure—for nurse triage of presenting patients, for example—they would rarely if ever look at the guideline again. Although the practice's sophisticated computer system allowed easy direct access to several accepted expert systems, and more generally to the internet, GPs very rarely used them. Their own average estimates were usually that they might use such facilities less than once every week; even then it would probably be only to download information to give to patients. Indeed, we never saw them use such systems to solve a clinical problem in real time. Rather than directly accessing new knowledge in the literature or from the internet and other written sources, the practitioners nearly always took shortcuts to acquiring what they thought would be the best evidence base from sources that they trusted. These sources included the popular doctors' and nurses' magazines mailed free of charge to practices in the United Kingdom. Most importantly, however, the shortcut to the best up to date practice was—for the GPs—via their professional networks among other doctors. The nurses had far fewer opportunities for such external networking and relied more on localised links between themselves, the practice doctors, and the community nurses linked to the surgery. Near to this cluster was a note of an ironic joke—made in the coffee room when a local consultant was visiting—about how GPs “always keep up with the all research literature [ha ha].” We recalled, on returning to the field notes, how avidly the partners capitalised on the consultant's visit to find out about the latest developments in his field and to ask him—both through the coffee room chat and at a lunchtime seminar—about some recent difficult cases. Was this not, we asked ourselves, an example of the importance of “Meetings,” rather an “Each other?” Or was it “Education/CPD?” We also linked it to a nearby cluster called “Opinion leaders” and then realised that although many opinion leaders were external to the practice, some were internal, as in the example of statins policy development. This was amply confirmed when we later saw how partners took leading roles—for example, on asthma or diabetes—at formal practice meetings. It became clear as this train of analysis developed that once the group had entrusted themselves to the expertise of an external or internal opinion leader, they would not then question the evidence source. Moreover, they often vaguely referred to those same “meetings with each other” when we asked them to reflect on the reasons for decisions about individual patients. So was this indicative of collective mindline development? Networking was vital in order to know which colleagues to trust. A great deal of the social interaction and professional comings and goings between doctors, nurses, and other practice staff (and beyond) could be seen as a way of checking out who or what were the most authoritative and trustworthy sources and ascertaining what “they say.” However, our participants rarely if ever questioned whether “they” (that is, authoritative sources) practised the linear-rational process traditionally linked to evidence based health care (fig 1, levels 1 and 2), or even the extent to which the views that they conveyed were rooted in explicit research evidence (level 3). This was simply assumed on the basis of trust in “their” expertise. In contrast, the views relayed to practitioners by pharmaceutical representatives, and to a lesser extent the centre of the NHS, were regarded with considerable scepticism, although that did not necessarily mean that they were without influence, as the practitioners themselves admitted. The local primary care trust pharmaceutical adviser had, however, earned the respect of the practitioners and was a highly trusted source. In short, we found that clinicians rarely accessed, appraised, and used explicit evidence directly from research or other formal sources; rare exceptions were where they might consult such sources after dealing with a case that had particularly challenged them. Instead, they relied on what we have called “mindlines,” collectively reinforced, internalised tacit guidelines, which were informed by brief reading, but mainly by their interactions with each other and with opinion leaders, patients, and pharmaceutical representatives and by other sources of largely tacit knowledge that built on their early training and their own and their colleagues' experience. The clinicians, in general, would refine their mindlines by acquiring tacit knowledge from trusted sources, mainly their colleagues, in ways that were mediated by the organisational features of the practice, such as the nature and frequency of meetings, the practice ethos, and its financial and structural features, including the computer system. When describing what we call mindlines, clinicians told us, for example, that they were grown from experience and from people who are trusted; they were “stored in my head” but could be shared and tested and then internalised through discussion, while leaving room for individual flexibility. Once compiled, each individual practitioner's mindlines were adjusted by checking them out against what was learnt from brief reading or from discussions with colleagues, either within or outside the practice. The mindline might well be modified when applied to an individual patient after discussion and negotiation during the consultation; at this stage patients' ideas of what is the appropriate evidence about their particular case (their own personal history, what their family has experienced, what they have read in the media, and so on) could influence the application or even the continuing development of the mindline. Further adjustment might subsequently happen during swapping stories with colleagues or in audit or “critical incident meetings.” In those rare challenging cases in which practitioners felt they did not have a ready mindline, they would later read up or ask around so that they could develop one for the future. 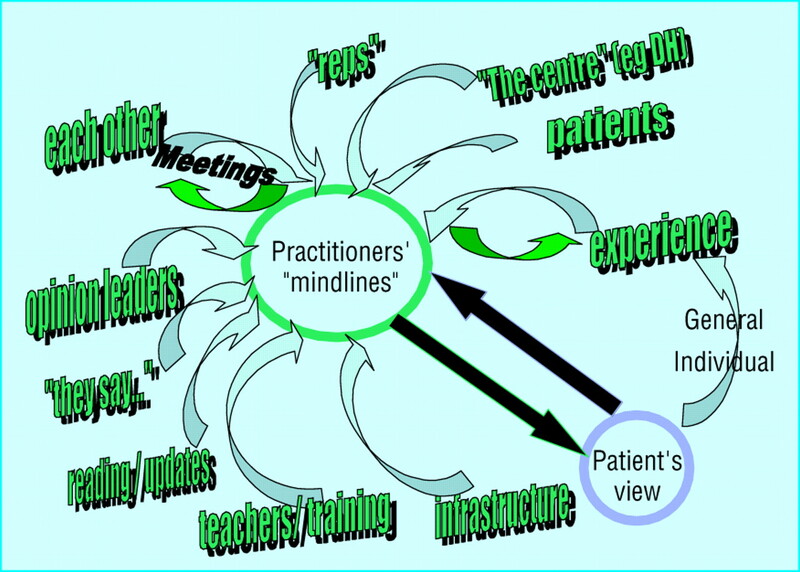 Mindlines were therefore iteratively negotiated with a variety of key actors, often through a range of informal interactions in fluid communities of practice, interactions with and experience of patients, and practice meetings. The result was day to day practice based on socially constituted knowledge (fig 2). We observed the same pattern of knowledge management in the “quality practice award” and other practice meetings. When formulating a practice protocol for the management of a given condition, clinicians relied on one of the partners with a special interest in that field to produce a summary of current best practice (box 3). These discussions sometimes resulted in modification of the computerised protocols that were available to prompt clinical actions, but which were not often actually needed as they had already been internalised through the discussions. Our ethnography was based largely on one practice and checked in a contrasting practice; further similar work will be needed to determine the transferability of our findings to other centres. Although the sample consisted of hundreds of interactions and events carried out by more than 15 practitioners, these were all within just two practices, which each had particular organisational cultures. We know of other practices, for example, where partners make more use of online information in their day to day practice and practices where very little communication occurs between the clinicians and no recognisable “community of practice” exists. To test our model it would be necessary to explore how knowledge is put into practice in such different organisational structures and cultures. 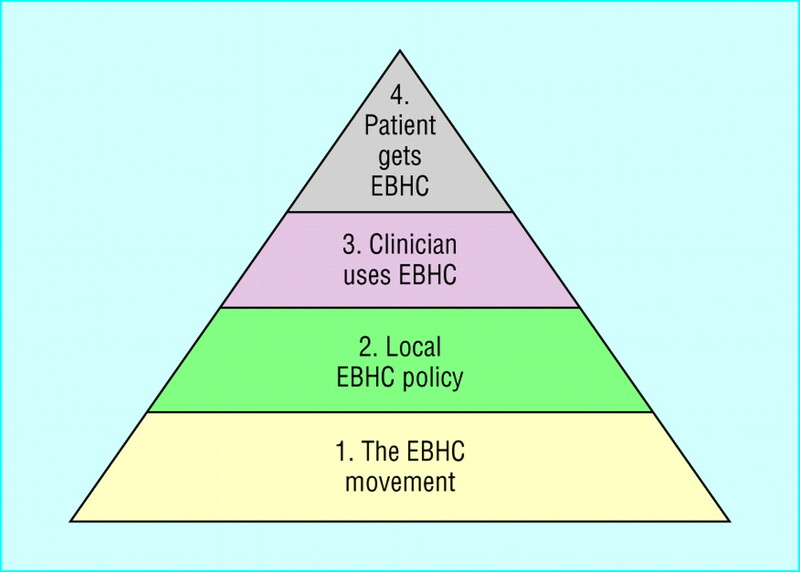 Nevertheless, the two practices used were acknowledged to be among the best in their localities; our results therefore strongly suggest that it is unrealistic to expect even the best clinicians to rely on the full process of evidence based health care promulgated by its advocates (fig 1, level 1). We need to recognise that—just as the literature on knowledge management describes in other fields4 7 25—clinicians usually work not with explicit codified knowledge (such as guidelines) but with “knowledge in practice.” We found that our sample instinctively did this by constantly comparing their own and each others' tacit and explicit knowledge as they formulated their mindlines. In doing so, they omitted any explicit checks of the quality of the evidence base, but relied instead on their “communities of practice.”21 22 26 This was a social process that entailed a range of largely local “actor networks” (human, paper, and electronic) as sources of evidence.27 28 Thus, to return to the dilemmas that we listed in our introduction, mindlines, because they encapsulate tacit and explicit knowledge sources, are a buffer against rigid cookbook adherence to codified knowledge; and because they emerge from practitioners' communities of practice and actor networks, they may be the key to designing generalised techniques for implementing research that capitalise on, rather than try to factor out, the power of local context. We believe that mindlines are more complex than the “heuristics” and “rules of thumb” described elsewhere, as they are not simple cognitive shortcuts.14 15 Although similar to the concept of “scripts,”13 in so far as they are learnt, internalised sequences of thought and behaviour that people find it almost impossible to articulate, mindlines seem to be more reliant on professional interactions. They are more flexible than scripts, more like internalised guidelines—hence our new term. Even so, mindlines may seem to be a dangerous shortcut when compared with the formal model of evidence based health care. However, their use is unsurprising, as there is every reason to suppose that it is knowledge in practice that is needed for practising a knowledge based profession, and practitioners do not have the time (nor usually the skills) to rigorously review and combine all the key sources of tacit and explicit knowledge themselves. Thus the real skill of the practitioner might be expected to be that of learning reliably from the knowledge of trusted sources either individually or through working in a community of practice. If this is the case, we need to make sure that the knowledge of the key opinion leaders, from medical or nursing school onwards, is based on research and experiential evidence and wherever appropriate follows the evidence based healthcare model. Training in critical appraisal of research might therefore be most usefully targeted at those who are likely to be the opinion leaders to whom most practitioners turn for their knowledge.29 30 Moreover, the teaching of evidence based health care might also include explanation of the role of communities of practice, the strengths and weaknesses of taking such shortcuts, and each practitioner's potential role in helping to shore up and strengthen the evidence base of the mindlines of their colleagues. If our findings are correct, practitioners have a collective professional responsibility to ensure that mindlines are based on research evidence wherever possible. In order to do this, the potential of networking as part of continuing professional development must be recognised and fostered, and appropriate information must be targeted, through a variety of routes, to the relevant individuals. This also has important implications for the dissemination of new clinical research findings by using not the sources of knowledge that researchers and the government think practitioners should use but the actual sources that they do use. We thank Dale Webb, who carried out some of the formal interviews. Above all we thank the staff of “Lawndale” for their forbearance in allowing us to “hang around” over all this time and learn so much from them about the day to day practice of primary care. Thanks also to the “Urbchester” GPs for the very fruitful time spent there. Contributors Both authors jointly conceived and designed the study, did the fieldwork, and wrote the paper. They are joint guarantors. Funding Grant from former Department of Health South East Regional Office R&D Directorate.
. Evidence-based healthcare: how to make health policy and management decisions Edinburgh: Churchill Livingstone, 1998.
eds. Getting research into practice London: BMJ Books, 1998.
eds. Evidence-based practice: a critical appraisal Oxford: Blackwell Science, 2000. Working knowledge: how organisations manage what they know. Boston: Harvard Business School Press, 1998.
. Personal knowledge: towards a post-critical philosophy London: Routledge and Kegan Paul, 1958.
. The tacit dimension London: Routledge and Kegan Paul, 1967.
. The knowledge creating company: how Japanese companies create the dynamics of innovation Oxford: Oxford University Press, 1995.
. The values of quantification. In: Law J, ed. Power, action and belief: a new sociology of knowledge? (Sociological Review Monograph 32.) London: Routledge and Kegan Paul, 1986.
. No magic targets! Changing clinical practice to become more evidence based. Health Care Manage Rev 2002;27: 35–47.
. Bridging the research practice gap: exploring the research cultures of practitioners and managers. J Adv Nurs 1998;28: 428–37.
. Interlocking interactions, the diffusion of innovations in health care. Hum Relat 2002;55: 1429–49.
. Getting evidence into clinical practice: an organisational behaviour perspective. J Health Serv Res Policy 2000;5: 96–102.
. Asking for ‘rules of thumb’: a way to discover tacit knowledge in general practice. Fam Pract 2002;19: 617–22.
. Use of rules of thumb in the consultation in general practice-an act of balance between the individual and the general perspective. Fam Pract 2003;20: 514–9.
. Resisting evidence: the study of evidence-based medicine as a contemporary social movement. Health: An Interdisciplinary Journal for the Social Study of Health, Illness and Medicine 2003;7: 267–82.
. Small places, large issues: an introduction to social and cultural anthropology London: Pluto Press, 2001.
. The professional stranger San Diego: Academic Press, 1996.
. The ethnographic interview Florida: Harcourt Brace Jovanovich, 1979.
. Sensemaking in organizations Thousand Oaks, CA: Sage Publications, 1995.
. Communities of practice: learning, meaning and identity New York: Cambridge University Press, 1998.
. Organisational learning and communities of practice: towards a unified view of working, learning, and innovation. Organisational Science 1991;2: 40–57.
. A case study of knowledge management in multi-agency consumer-informed “communities of practice”: implications for evidence-based policy development in health and social services. Health: An interdisciplinary Journal for the Social Study of Health, Illness and Medicine 2003;7: 283–310.
. Naturalistic inquiry Beverly Hills: Sage, 1985.
. The knowing organization: how organizations use information to construct meaning, create knowledge and make decisions New York and Oxford: Oxford University Press, 1998.
. The social life of information Boston: Harvard Business School Press, 2000.
. Science in action: how to follow scientists and engineers through society Boston: Harvard University Press, 1988.
. Some elements of a sociology of translation: domestication of the scallops and the fishermen of St Brieuc Bay. In: Law J, ed. Power, action and belief: a new sociology of knowledge? (Sociological Review Monograph 32.) London: Routledge and Kegan Paul, 1986.
. Medical innovation, a diffusion study Indianapolis: Dobbs Merrill, 1966.
. Understanding the role of opinion leaders in improving clinical effectiveness. Soc Sci Med 2001;53: 745–57.